The westernmost state of India, Gujarat, is dotted with umpteen holy sites that are of immense significance to Hindu pilgrims. One such extremely holy site is the Narayan Sarovar which is situated at a distance of nearly 155kms away from Bhuj. Of the five lakes regarded as the holiest as per Hindu mythology, the Narayan Sarovar is one of these. The other four are the Pushkar Sarovar, Mansarovar, Pampa Sarovar, and Bindu Sarovar. The lake, as its name clearly gives away is dedicated to Lord Vishnu-one of the Trinity Gods in the Hindu pantheon of gods and goddesses. There is a hamlet flanking the lake that goes by the name of Narayansar which is an abbreviated form of Narayan Sarovar. While approaching the lake from the township of Bhuj, your eyes will feast on the spectacular sights of the salty wastelands of the Rann of Kutch on either side, and you’ll be greeted by welcome arches. Travelling a further 4 km in a westerly direction, you’ll come across the Koteshwar Mahadev Temple. As the temple is much above ground level, clambering up to the shrine’s highest point offers you spellbinding vistas of the Arabian Sea. There are other temples in the vicinity including the Laxminarayan, Shri Trikamrajii, Dwarkanath, Laxmiji, Ranchodrajii, Adinarayan, and Govardhannathji that are a must-see for devout pilgrims. 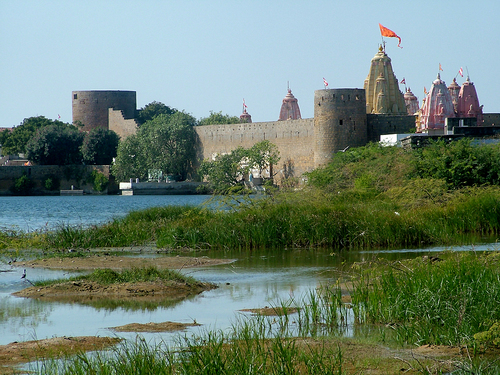 Bhuj since times immemorial had been a drought-prone area and extremely susceptible to famines. It is alleged that during the Puranic era, sages had fervently offered their supplications to Lord Vishnu to awash the arid area with water. Heeding to their earnest pleas, the lord incarnated as ‘Narayan’ avatar and rubbed his toe on the earth that led to the entire area getting inundated with water. 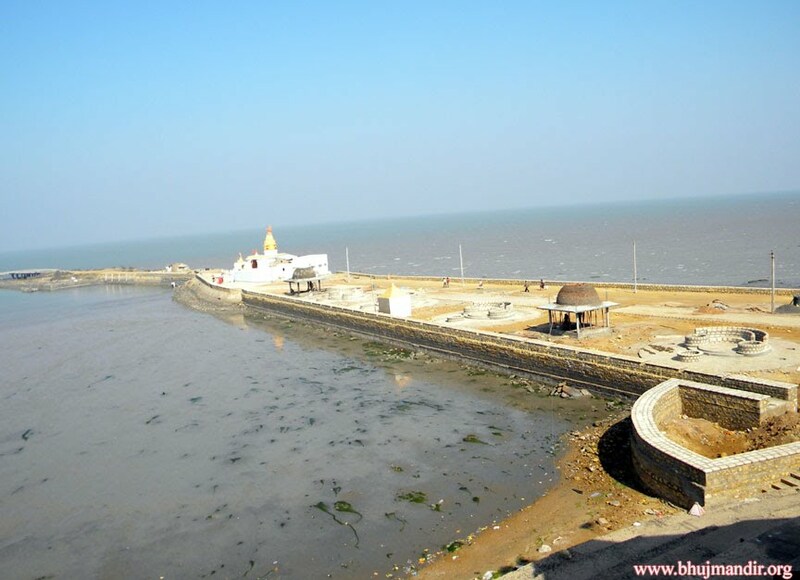 Narayan Sarovar is a part of the Narayansar village and is located in Lakhpat taluka of Kutch district. It is about 4 kilometers from the ancient Koteshwar temple. The lake can be visited anytime of the year but journeying to the area in summer via Bhuj can be tortuous because of the unbearable heat. Therefore, planning a trip in winter season would be worth it.